Focus Type: Manual Focal Length Multiplier: None. The Minolta MD is one of the classic Minolta camera lenses for walk-around SLR film photography. Originally designed for Minolta manual SLR cameras, the 50 mm f/2.0 lens has a narrow focal plane that enables the photographer to get sharp detail on the central subject without distracting bright spots in a smooth out-of-focus background. Features include a knurled plastic focusing grip, a depth-of-field scale, and a mounting index for aligning the lens with the bayonet-type mount on the camera body. The Minolta MD Lens also features a minimum aperture lock to prevent accidental movement of the aperture ring while in programmed auto-exposure mode. 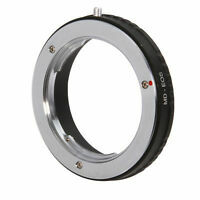 Like all Minolta camera lenses in the MD series, the 50 mm f/2.0 lens works with Minolta auto-exposure (AE) cameras. Photographers can use the lens in programmed AE or aperture-priority AE modes. In aperture-priority AE mode, the user controls the depth of field by manual adjustments to the aperture, while the camera's auto-exposure function reads the light meter and adjusts the shutter speed right up to instant exposure. The Minolta MD does not directly fit Minolta's Maxxum film cameras or digital cameras. However, adapters are available for many formats, including the 4/3 digital SLR format. I wanted to experiment with "legacy" lenses on my Panasonic G2 and chose this lens to start. (It's one of the cheaper lenses out there.) 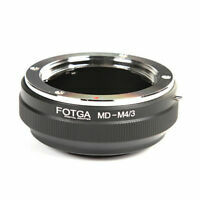 This is a quality feeling lens - it's made of metal and feels like it and the focusing is smooth and precise. It works well on my G2 + adapter and I have found that I really enjoy manual focusing. The f2 aperture allows me to take more photos indoors, however while my results are fine for online viewing and normal sized prints, it just doesn't produce images as sharp or with as much detail as even the G2 kit lens. This lens did allow me to get some action shots of my children that I couldn't get with the auto-focus of a micro 4/3 camera. And it is MUCH easier to focus manually than the focus by wire of the m4/3 lens. Worth trying if you are not sure if you will like using legacy lenses. Sharp, compact, and budget friendly. Late MD version doesn't have quite the same all metal beautifully crafted feel and handling as the earlier and faster versions, but it's still good, and compact. Zoom is still smooth. Compared to other similar film era 50's. It's not as fast but it is very sharp, very good wide open even, though benefits from stopping down a little, like most lenses. For how cheap it tends to be it's a great, solid manual focus 50 and worth picking up. Great under estimated lens. Great general purpose lens for street photography, video documentaries or portrait photos with the 4/3 or NEX systems. Este lente es uno de esos que sirven para arquitectura y todo tipo de fotografía geométrica, posee muy poca o nula distorsión El brokeh no es tan fino pero igualmente se puede usar para retrato aunque su fuerte va mas para paisaje.